I fear that this will be a short entry this month as I am on holiday in U.S.A., firstly in Massachusetts for a few days, then travelling through New Jersey to Washington DC area where I have been for the last two weeks. The Fall colours are over and it was sad to see the devastation along the New Jersey coast in the wake of storm Sandy. Even here in DC there is evidence of many fallen trees and many large trees washed up on the banks of the Potomac. I have seen reports of extensive flooding in U.K. and wonder how my garden is faring. Some of the grasses were looking splendid before I left. The Molinia “Bergfreund” was looking splendid in the sunshine. 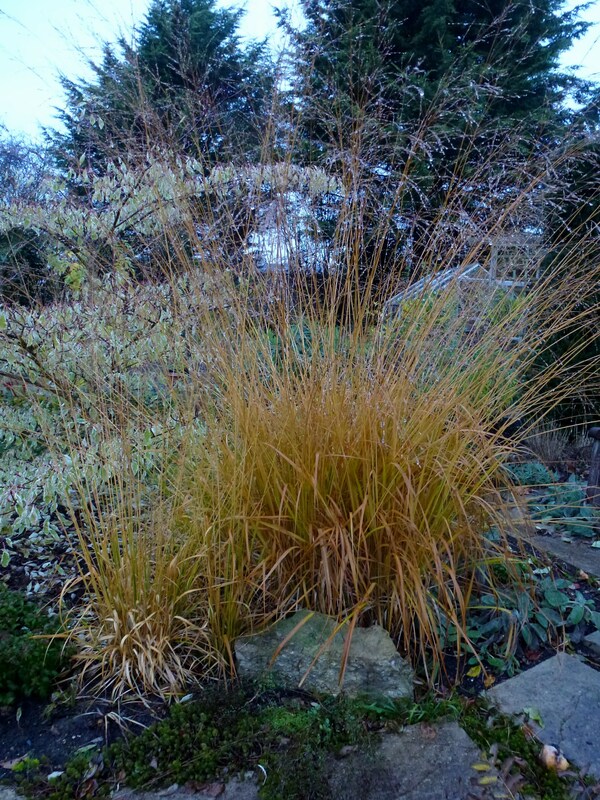 It is similar to Molinia “Transparent” with tidy mounds of foliage that turn orange in Autumn. It is deciduous but I leave the foliage in place as it provides a popular shelter for hibernating ladybirds. I have planted Allium gigantium under it and this seems to work well as its flowers and foliage and decaying as the grass gets going in Spring. I visited Dumbarton Oaks Garden a few days ago. The Garden was created by Mildred and Robert Barnes Bliss, collectors and patrons of art and scholarship in the humanities. Robert Bliss was a diplomat in the United States Foreign Service and they travelled extensively in South America and Europe. After a long search for a permanent home in Washington, they purchased the 1801 Federal-style house and property in June 1920. After buying the property they made extensive alterations and Mildred Barnes Bliss worked closely with renowned landscape designer Beatrix Farrand to transform the land surrounding the house into terraced gardens and vistas. They enhanced the resultant garden rooms with plant material and garden ornaments thus giving differing character and use. Trees are important in many of the rooms, framing views and enclosing spaces. Benches are fitted into corners thus providing both points of interest and places to rest. Urns and vases mark transitions between rooms. Posted on December 8, 2012, in National Chairman's Blog, News 2012 and tagged dumbarton oaks garden, robert bliss. Bookmark the permalink. Leave a comment.